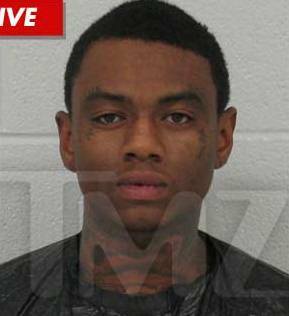 *TMZ is reporting that Soulja Boy was arrested early this morning for possession a lot of weed. The 21-year-old rapper, born DeAndre Cortez Way, was collared early this morning by Temple Police Department officers in Temple, GA at 3:15 a.m. Law enforcement sources tell TMZ that Soulja was in a car with four other men, when it was pulled over for a traffic violation. During the stop, cops found a “substantial amount” of marijuana and cash inside the vehicle, according to TMZ. Soulja and the four other men were all arrested. At press time, the rapper is still being detained in Carrol County Jail. Officers also found guns inside the car, though it’s unclear if any of the men had the proper licenses to be in possession of the firearms.